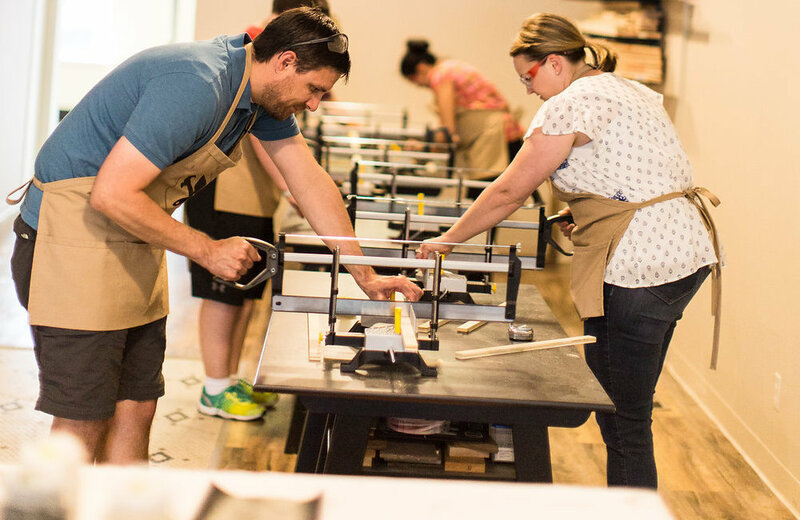 This month’s make-and-take classes across the Twin Cities metro. Another month, another lovely lineup of DIY class listings! April offers a little bit of everything in the Twin Cities metro, from spring-inspired make-and-takes to table knitting chunky throw blankets. This month, Socially Handcrafted leads the charge with nearly one dozen opportunities to get your craft on. Google describes Carver Junk Co. as a “cozy shop for restored vintage furniture, housewares, and accessories with a rustic-chic aesthetic.” True, but they left out the kicker: They offer some can’t-miss, one-of-a-kind DIY classes, too. Thursday, April 11 – Farmhouse Pedestal Workshop, 6 p.m.
Saturday, April 13 – Make-N-Take: Bunny or Chick Block, 10 a.m.
Thursday, April 18 – Succulent Box Workshop, 6 p.m.
Times subject to change. For additional info and locations, visit carverjunkcompany.com. Create Space in White Bear Lake has classes for all ages and levels, hosts private events, public classes, drop-in hours, and even gives back to the local community by donating 10 percent of their revenue. Thursday, April 4, 18, 25 – Open hours, noon to 6 p.m.
Friday, April 5, 19, 26 – Open hours, 10 a.m. to 6 p.m.
Saturday, April 6, 20, 27 – Wood Sign Class, 2 p.m.
Friday, April 12, 19, 26 – Open hours, 10 a.m. to 6 p.m.
Friday, April 12 – DIY Wreath Class 6 p.m.
Saturday, April 13, 20, 27 – Open hours 10 a.m. to 6 p.m.
Saturday, April 13 – DIY Wreath Class, 2 p.m.
For additional info and locations, visit yourcreatespace.com. LAB MPLS collaborates with local artists who come into their Minneapolis studio to teach “labs”—offering a wide variety of creative explorations from cocktails, calligraphy, watercolor, florals, and more. Wednesday, April 3 – Leather Lab 1.0, 6:30-9 p.m.
Saturday, April 6 – Macrame Lab, 10:30 a.m. to 1 p.m.
Thursday, April 11 – Weaving Lab, 6:30-9 p.m.
For additional info and locations, visit labmpls.com. Projects In Person, better known as PIP, offers wood-based home decor projects that range from headboards to cutting boards and everything in between. They bring the tools; you bring the creativity. Saturday, April 6 – Headboard, 5 p.m.
Friday, April 12 – Giant Ruler or Menu Board, 7 p.m.
Saturday, April 13 – Cutting Board, 11 a.m.
Saturday, April 13 ­– Floating Shelves, 5 p.m.
Wednesday, April 17 – Copper + Wood Ladder, 7 p.m.
Thursday, April 18 – Serving Tray, 7 p.m.
Friday, April 19 – Clock Workshop, 7 p.m.
Friday, April 26 – Bean Bag Boards, 6 p.m.
For additional info and locations, visit projectsinperson.com. Whether it’s a corporate event, public class, or private party, Raw 2 Rustic travels far and wide with all the stencils, stains, paint, and designs you need to create a rustic, contemporary work of art that will prove to be a flawless fit in your home. Tuesday, April 16 – 1 Large or 2 Small Signs, 6:30 p.m.
Thursday, April 18 – 1 Small Sign + Wine, 6:30 p.m.
For additional info and locations, visit raw2rustic.com. Sawdust Savvy, located in Stillwater, offers plenty of “Pick Your Project” workshops where participants can complete 22 different projects—including wood signs, decorative boxes, serving/decorative trays, photo ledges, blanket ladders, shelves, and even a custom farmhouse table for your kitchen or dining room. Monday, April 1 – Sawdust Savvy Uncensored, 18+ Workshop, 6-9 p.m.
Friday, April 5, 26 – Pick Your Project, 6-9 p.m.
Saturday, April 6 – Pick Your Project, 10 a.m. to 1 p.m., 2-5 p.m., 6-9 p.m.
Sunday, April 7 ­– Signs + Suds, 1-4 p.m.
Wednesday, April 10 – DIY Bottle Opener Workshop, 6-9 p.m.
Saturday, April 20 – Pick Your Project, 11 a.m. to 2 p.m.
Saturday, April 27 – Pick Your Project, 2-5 p.m.
For additional info and locations, visit sawdustsavvy.com. Socially Handcrafted, located in Burnsville, has a personality. I mean, their motto is “…because crafting is cheaper than therapy.” Not only do they have a sense of humor, but they’re Minnesota’s only “speakeasy” DIY studio—sure to provide a new, exciting, and promising experience. Friday, April 5 – Spring Porch Signs, 6-9 p.m.
Saturday, April 6 – Chunky Chenille Throw, noon to 2 p.m.
Thursday, April 11 – Interchangeable Home Sign, 6-9 p.m.
Friday, April 12 – Chunky Chenille Throw, 7-9 p.m.
Saturday, April 13 – Paint Pouring, 6-8 p.m.
Wednesday, April 17 – Crochet A Fabric Yarn Basket Class, 6-9 p.m.
Saturday, April 20 – Spring Porch Signs, 1-4 p.m.
Saturday, April 20 – Paint Pouring, 4:30-6:30 p.m., 7-9 p.m.
Friday, April 26 – Therapy Night, 7-10 p.m.
For additional info and locations, visit sociallyhandcrafted.com.